A bony growth on the underside of the heel bone. The spur, visible by X-ray, appears as a protrusion that can extend forward as much as half an inch. 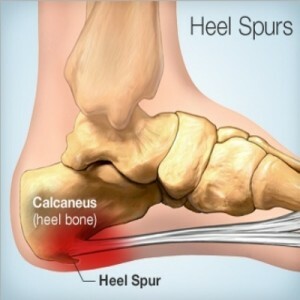 When there is no indication of bone enlargement, the condition is sometimes referred to as “heel spur syndrome.” Heel spurs result from strain on the muscles and ligaments of the foot, by stretching of the long band of tissue that connects the heel and the ball of the foot, and by repeated tearing away of the lining or membrane that covers the heel bone. These conditions may result from biomechanical imbalance, running or jogging, improperly fitted or excessively worn shoes, or obesity. Both heel pain and heel spurs are frequently associated with plantar fasciitis, an inflammation of the band of fibrous connective tissue (fascia) running along the bottom (plantar surface) of the foot, from the heel to the ball of the foot. It is common among athletes who run and jump a lot, and it can be quite painful. 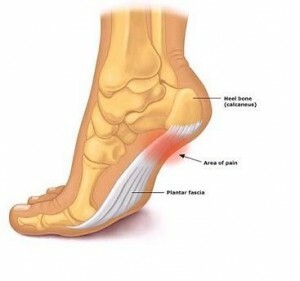 The condition occurs when the plantar fascia is over time beyond its normal extension, causing the soft tissue fibers of the fascia to tear or stretch at points along its length; this leads to inflammation, pain, and possibly the growth of a bone spur where the plantar fascia attaches to the heel bone. The inflammation may be aggravated by shoes that lack appropriate support, especially in the arch area, and by the chronic irritation that sometimes accompanies an athletic lifestyle.Resting provides only temporary relief. When you resume walking, particularly after a night’s sleep, you may experience a sudden elongation of the fascia band, which stretches and pulls on the heel. As you walk, the heel pain may lessen or even disappear, but that may be just a false sense of relief. The pain often returns after prolonged rest or extensive walking. Heel pain sometimes results from excessive pronation. Pronation is the normal flexible motion and flattening of the arch of the foot that allows it to adapt to ground surfaces and absorb shock in the normal walking pattern.As you walk, the heel contacts the ground first; the weight shifts first to the outside of the foot, then moves toward the big toe. The arch rises, the foot generally rolls upward and outward, becoming rigid and stable in order to lift the body and move it forward. Excessive pronation—excessive inward motion—can create an abnormal amount of stretching and pulling on the ligaments and tendons attaching to the bottom back of the heel bone. Excessive pronation may also contribute to injury to the hip, knee, and lower back. Pain at the back of the heel is associated with Achilles tendinitis, which is inflammation of the Achilles tendon as it runs behind the ankle and inserts on the back surface of the heel bone. It is common among people who run and walk a lot and have tight tendons. The condition occurs when the tendon is strained over time, causing the fibers to tear or stretch along its length, or at its insertion on to the heel bone. This leads to inflammation, pain, and the possible growth of a bone spur on the back of the heel bone. The inflammation is aggravated by the chronic irritation that sometimes accompanies an active lifestyle and certain activities that strain an already tight tendon.